The sad news is PayPal payment getaway is no more valid in Clixsense. On Monday, February 6th PayPal placed a hold on our account. They advised me that due to new policy changes the Clixsense business model was now in violation of their user agreement and we would have to stop processing all payments (in and payments out). What do to get paid again from Clixsense? Don’t give up home and get rid of confusion become Clixsense has several more way to get paid. Recently I receive an email from Clixsense to update my payment withdraw mode to another alternate. So forget about PayPal and simply follow the instruction to your Clixsense account to update the payment withdraw Method. It’s quite very simple and easy. Also Read: Clixsense.com Review – How I Earn my First $25 from India? How I change my payment withdraw Method to Payoneer? Payoneer is an International Money Transfers method almost work similarly like PayPal. Creating a new Payoneer account is simple and easy. Only you have to sing in with some basic profile information and a bank account details. (Payer name, Bank account number, IFSC Code, bank name etc.) now set your username and password and hit the get started button. Now set back and relax while Payoneer team will verify your account and once they send a confirmation link you are good to go for Clixsense payment withdraw directly to your bank account. Back there in PayPal will be paid once I manage to earn $6 (As I am using Clixsense Premium account) and service change was quite satisfying. But here in Payoneer, I have to wait until to earn $20 and I will be charged $2 (Angry) in order to cash out money into my bank account. The good thing about Payoneer is- they will going to send money directly to my bank account while getting payment from PayPal in India is quite bit complicated. What if, if you don’t like Payoneer? Instead of Payoneer Clixsense has few more payment method like PayToo, Tango Card, Payza and for the latest update from Clixsense, they are going to introduce Skrill within a day. So look like lots of new adventure going to happen in soon in Clixsense. How much time does it take to get my money through Payoneer? 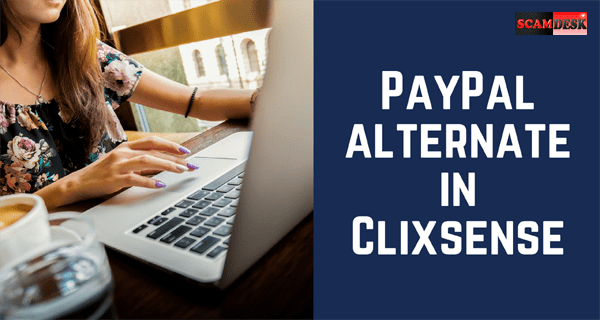 Will Payoneer is become best alternate payment method in Clixsense after PayPal? How its effect Clixsense business especially upgrading to a premium account and earn money by referring to a premium account? Let me know what are the challenge we all have to face in Clixsense family? Also, know your views if you feel that your Clixsense earning is suddenly drop like me? I got an email regarding Dataposting jobs.in website through Fresh workers site. they re asking to pay rs.999 for registration.For each copy and paste in free classified sites we earn rs.4 they are saying while looking at demo they are showing rs.3 for completion of steps in demo. Please give a reply to my email id.